Thoresen Shipping is the dry bulk shipping arm of Stock Exchange of Thailand listed strategic investment group Thoresen Thai Agencies Plc (TTA). The business operates under our wholly owned subsidiaries of TTA, Thoresen Shipping Singapore Pte. Ltd. (TSS) and Thoresen & Co., (Bangkok) Ltd (“TCB”). With a heritage of offering shipping related services since 1904 and dry bulk since 1985, the group has well-established and deep roots in the global maritime community. Today, Thoresen Shipping boasts a modern fleet of 24 owned Handymax and Supramax sized vessels, comprising an effective balance of 14 geared and grabbed fitted bulk carriers and 10 “open hatch box shaped hold” vessels. Thoresen Shipping’s bulk carrier vessels are deployed in trades which service the needs of clients in a blend of COA’s / period charters and spot charters both in the Atlantic and Pacific Oceans. Thoresen Shipping’s box shaped vessels, which are suitable for bulk cargoes but are specifically designed for unitized break bulk trades such as wood pulp, windmills, steel and pipes, are also deployed in a blend of COA, period charter and spot tramping. Thoresen Shipping’s box shaped vessels are also equally distributed between the Atlantic and Pacific Oceans. Thoresen Shipping believes that by owning and commercially and technically managing its fleet, the company can provide a superior service to its customers in offering innovative, creative and flexible freight solutions. In addition to its own vessels, Thoresen Shipping is supplementing its trading activities with a fleet of chartered-in tonnage, which like Thoresen Shipping’s owned fleet, is commercially controlled by experienced and professional teams based in Singapore and Thailand. This additional hardware provides significant benefits to customers by offering them a higher frequency of Thoresen controlled vessels along with more competitive and flexible pricing strategies. Thoresen Shipping’ cargo clients include mining companies, agricultural traders, steel mills, power suppliers and other industrial end-users. They continue to choose Thoresen Shipping because of its consistent on-time performance, reliable service and flexibility. As a fully integrated shipping company and a volume carrier, Thoresen Shipping transports a wide range of dry bulk and break bulk commodities including ore, coal, pet coke, cement, clinkers, bauxite, alumina, concentrates, scrap, fertilisers, grains, agricultural products, forest products, wood pulp, steels, pipes and windmills. In 2011 Thoresen Shipping carried in excess of 8M tons of cargo with approximately 670 port calls. In 2015, we are setting our sights even higher. 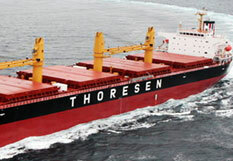 In 2011 Thoresen Shipping carried in excess of 8 million tons of cargo with approximately 670 port calls. © Copyright 2012 Thoresen Shipping All rights reserved.